The back story on this post, which pulls out a recipe from the archives (Danielle demoed this at Brookside and USBG this year ago) is that Adrienne discovered a (new) squash: Butterkin. Daughter Evangeline, coming in from Boston, wanted to try a pumpkin galette as a hardy vegetarian main course for our family gathering yesterday around Danielle’s table in her Washington DC home. The recipe (stay tuned) called for pumpkins but Evangeline wanted to make it with butternut. The shape wasn’t working however, so off we went to find small pumpkins that would work better. 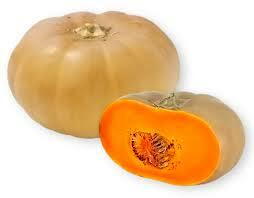 And there, in the hard-squash bins, was a Butterkin — a cross between pumpkin and butternut! So lovely to look at — the skin the nut-color of butternut, the inside flesh like a persimmon — and the perfect size. So how do we get to the soup? Well, there was quite a bit left over after the galette was executed. But that wasn’t all. At the farmer’s market earlier in the week, Adrienne fell under the spell of some gorgeous striped squash, which she mistook for Delicata — the vendor concurred as to its pedigree, so her mistake was not entirely without reason. After battling mightily with the squash in an unsuccessful attempt to slice it, she realized the squash was actually an acorn, albeit pale gold with lovely multi-hued stripes, not unlike the skin of Delicata. Well, the two are not interchangeable, especially in the Sweet and Sour Delicata recipe Adrienne was making for the T’G table, so the hard-shelled acorn squash ended up in the crisper, along with the leftover Butterkin. Lo, we have the ingredients for Triple Squash Soup (counting Butterkin as two squashes in one). This soup is a nice extension of the glories of the Thursday feast, but light enough to merit space on the Friday or Saturday table — or any time during the winter, for that matter. Make the soup: heat 2 Tbs. olive oil in a large stock pot, sauté the onions until soft. Add the garlic, ginger, curry powder, cayenne and apple, stir well and let cook two or three minutes. Add the squash and broth, bring to a boil, reduce heat to a simmer. Add coconut milk, honey and continue simmering for another 30-45 minutes, until all ingredients are very soft. 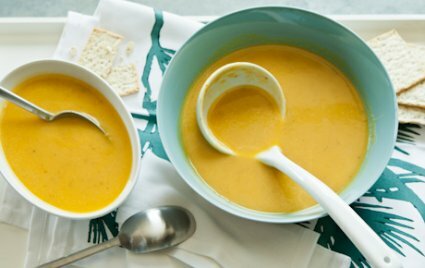 Puree the soup, with a hand-help machine, a blender, or pureeing in batches with a food processor. Adjust taste for salt. Garnish with paprika. Serves 6-8.